This soup consists a number of root vegetables and the name ABC might be the nutrition values of the vegetable such as; Vitamin A for Carrot, Vitamin B for Potato and Vitamin C for Onion. 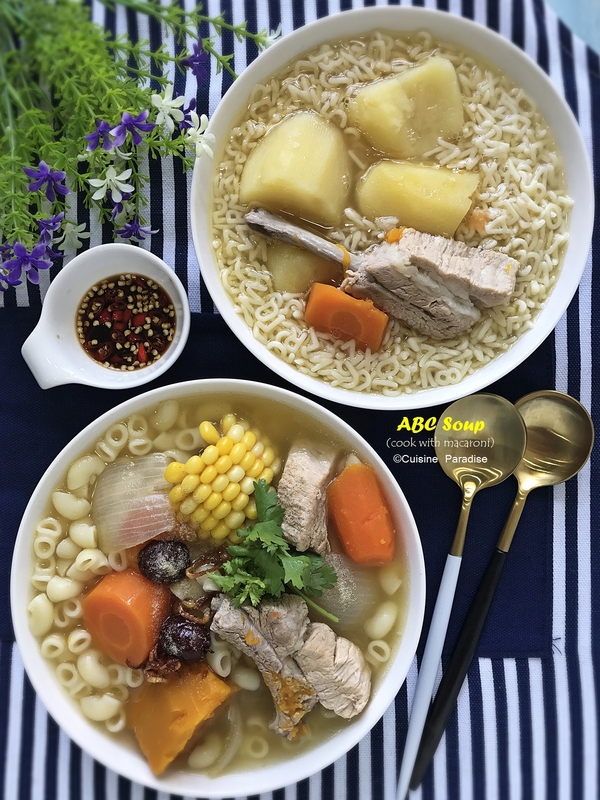 Watch how we prepared this ABC Soup and serve it with Macaroni. 2. Peel and cut potato, carrot, sweetcorn and pumpkin into chunks. 3. Peel onion and remove seeds from tomato then cut them into halved. 4. In a big stock pot add about 1 teaspoon of oil, saute onion and spareribs for a minute before adding carrot and potato. Give it a quick stir, cover and cook for another minute then add in the rest of the ingredients (except pumpkin). 5. Next add in hot water and bring it to boil then lower the heat and simmer for 15 minutes. Add pumpkin and continue to cook for another 5 minutes. 6. Lastly season to taste with salt. Turn off the heat and stand for 10 minutes while preparing the macaroni or noodle and serve them together. 7. Bring a pot of salted water to boil then cook macaroni according to packet instructions. Rinse and drain well then add into ABC soup and serve. 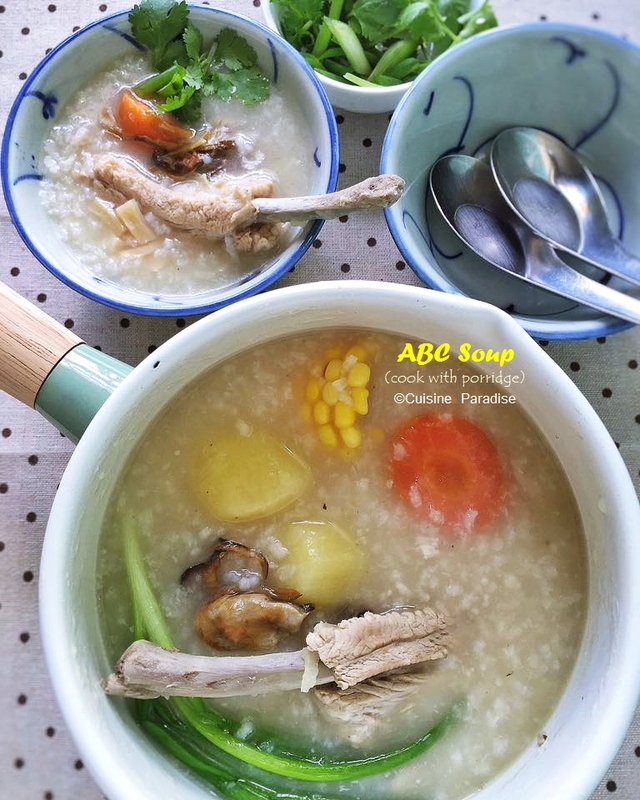 Other than using ABC Soup for macaroni or noodle, I also often use it to cook with porridge/congee. My method below might be different from yours since everyone has their own style plus the type of grains used might sometime affect the amount of liquid and texture too. 1. Rinse and soak the grains for at least 30 minutes before cooking. 2. 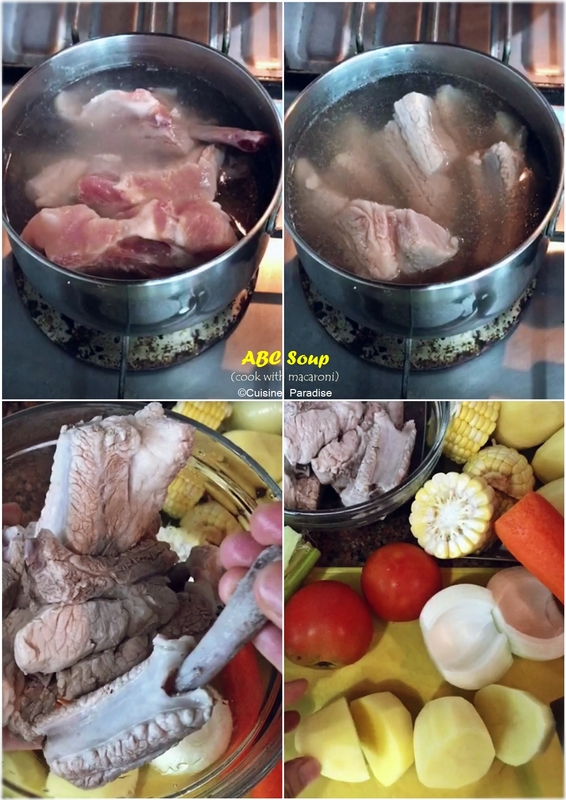 Transfer prepared soup stock, spare ribs and rinsed rice into a large pot then bring it to boil. When water starts boiling add spring onion, low the heat then cover and simmer for 20 minutes (stir the rice twice to prevent it from sticking to the bottom). 3. Next add pumpkin cubes and continue to cook for another 10 minutes until the grains are fluffy and mixture looks creamy (you can add in more stock if the porridge starts to dry up). 4. Turn off the flame, remove the spring onion then add in the potato, sweetcorn and carrot from the stock if your want. 5. 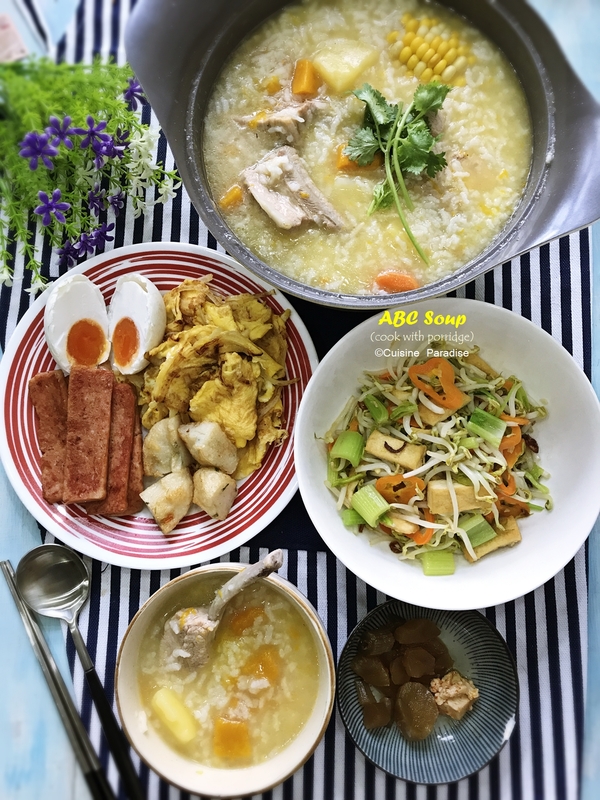 Season the porridge with salt and serve with chopped scallions or coriander and some sides like luncheon meat, vegetables, omelette and etc (optional). 2. Peel and cut potato, carrot, sweetcorn and onion into chunks. 3. 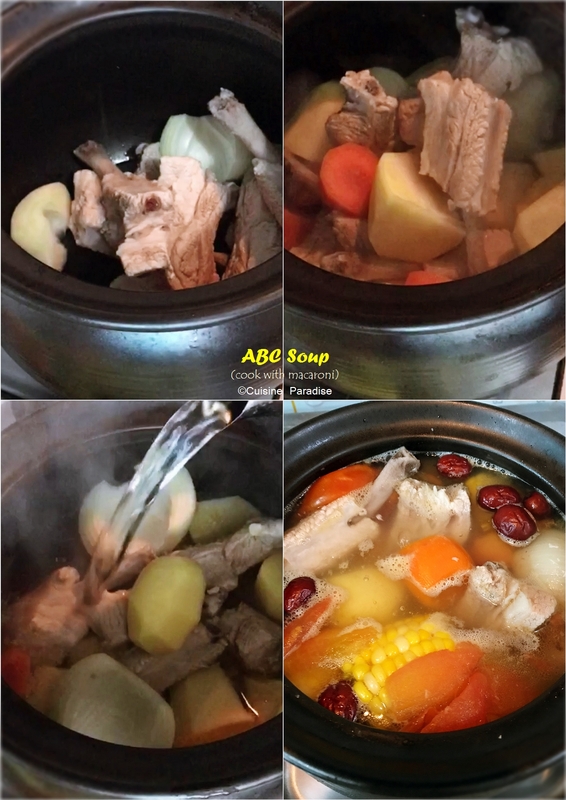 In a large pot, bring water to boil then add in all the ingredients. When water starts boiling add spring onion, low the heat then cover and simmer for 30 minutes until the grains are fluffy and mixture looks creamy. 4. Turn off the flame, remove the spring onion and season with salt. 5. Serve porridge on its own with chopped scallions or you can prepared extra sides like luncheon meat, vegetables, omelette and etc (optional). 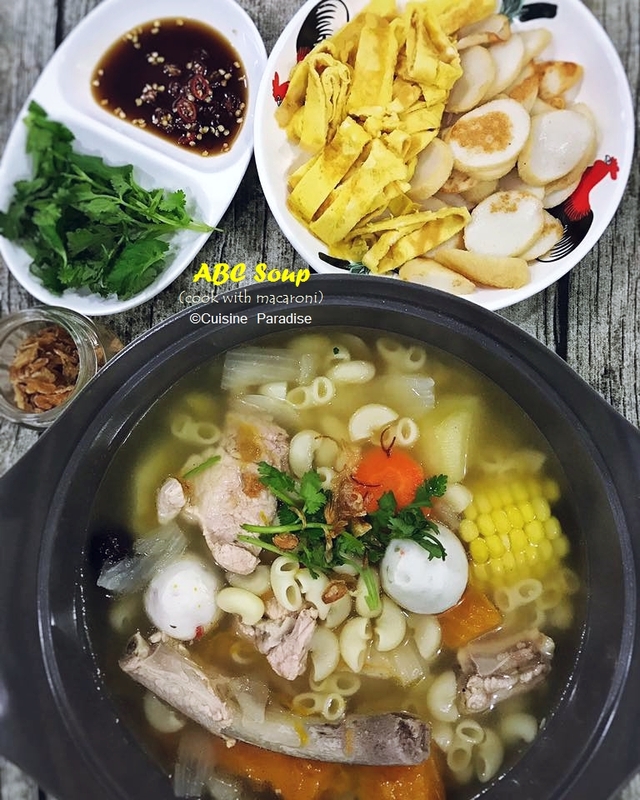 Feel free to try out different combination of ingredients to make your own ABC soup or porridge for your family. 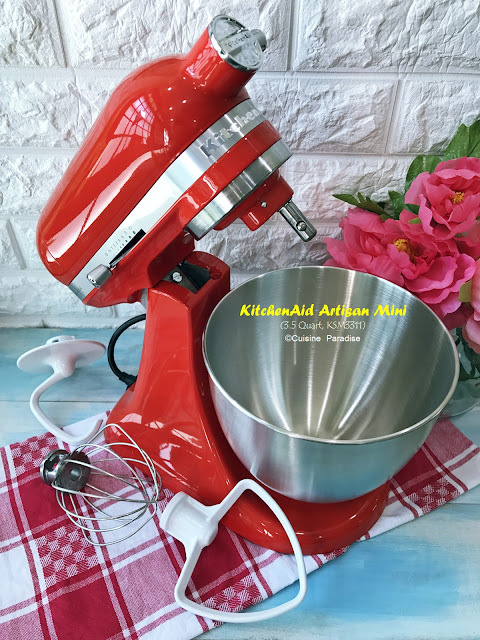 Remember cooking is all about your "love" for the ones who care for.